I own the original iPad. When the first iPad Mini came out, I didn't consider an upgrade because I felt I could get more time out of my iPad, but I also didn't think of it as a big upgrade at the time. The new iPad (iPad 4) at the time was not seriously considered either for similar reasons, but the upgrade was far greater. I bought the iPad Mini for my mother for last year's Christmas. I felt that it would be a great device for her and my father, as they could use it as a portable device, and since they both own and rely on laptops I thought that they would not see the merits of a full size iPad as great. They do not own a smartphone (my father doesn't own a cellphone), so it acts as a large smartphone as well. The first iPad Mini turned out to be a great device for them, as we have done FaceTime over countries and continents, it is a pocket album for their photos to show people, my mom brought it with her when she visited recently and was using it no problem once it was connected to our Wi-Fi. But I held out for the next generation iPad Mini because I was sure that Apple would come out with a Retina display model in the near future. And here we are, now with a retina iPad Mini, but an iPad Mini that has the same real world performance as the iPad Air and even the iPhone 5S. There are other differences, such as A7 chip, the cameras and the dock connector, but the above would be the main things for me, in that order. The weight compared to the original iPad is less than 1/2. This may be the deciding factor for me, even more than the software and hardware improvements. The iPad Mini is easily held by one hand, and will be easy to hold it in bed, or hold it above my face lying down. All in all, I may want a huge smartphone, but I don't think I need the cellular model. My commute is such that I don't need any entertainment (I live close to work), and I use my original iPad in the house 99.9% of the time where I have Wi-Fi. When I visit my family, I sometimes bring my iPad with me, but most of them have Wi-Fi at home so I don't have that much use for the cellular model. Since my children are still quite young, they require a lot of my attention when we are out, and I don't have enough attention left for a smartphone or anything that can distract me from taking care of them. 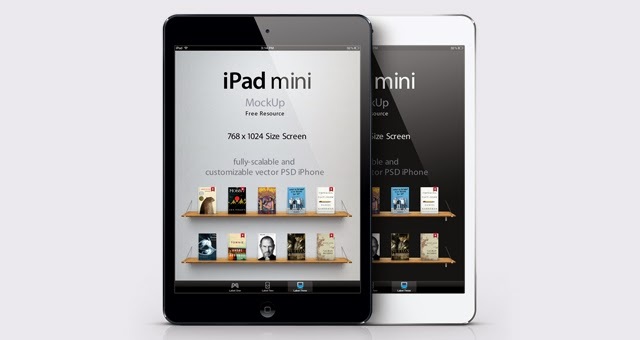 Below are some articles written about the Retina iPad Mini that I liked most. Judging by this article the performance of the Retina iPad Mini is exemplary, as Garageband works with multiple soundtracks loaded. However, I am very curious about Touch ID, and would like to have it on my next Apple device if it is extremely useful. Having not to push a physical button just makes sense to me. There is an emphasis on the performance jump, particularly what is essentially a two generation performance jump, notably going from a A5 chip to a A7 chip. This article makes it even more convincing that the Retina iPad Mini and the iPad Air are the same performance, and decisions should be based on how you interpret the size of each device. The most thorough review as always. One thing of concern is the color gamut test, where the iPad Air represents excellent color while the Retina iPad Mini is off. I'm sure it is not something I would notice in regular use, but it does raise some concerns on the display itself, and it would be stuck in my mind when other display issues arise.